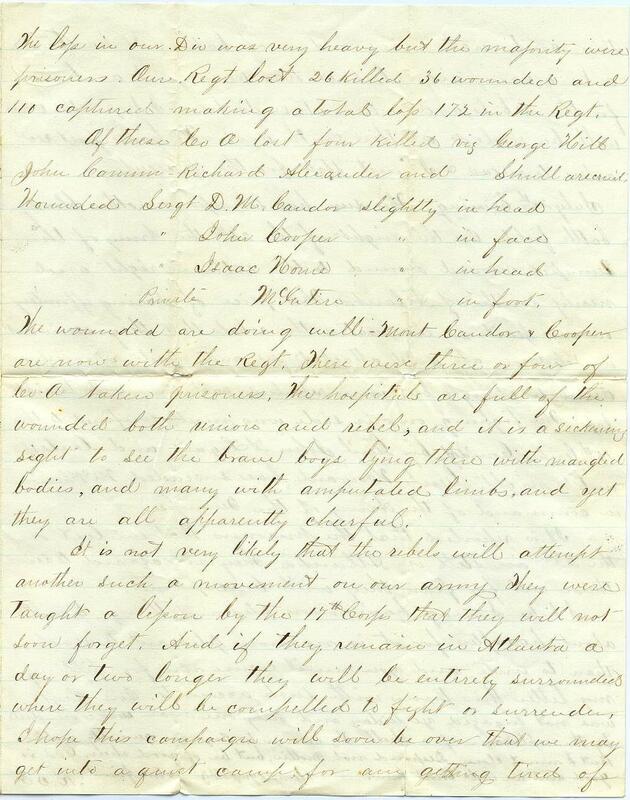 Item Description: Letter from Robert Stuart Finley to his fiancee Mary A. Cabeen. Finley was a member of the 30th Illinois Infantry, serving in Tennessee, Mississippi, Alabama, Louisiana, and Georgia. 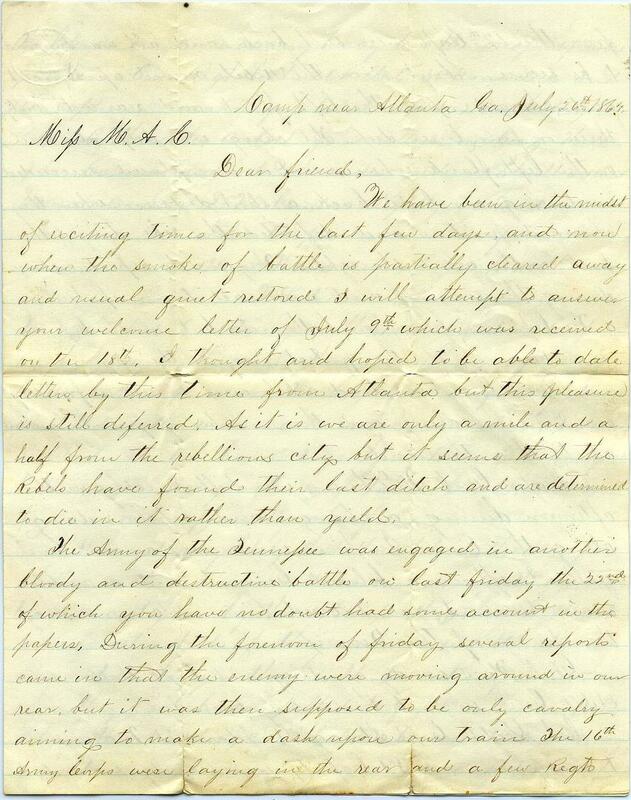 In his letter, he describes the events of the Battle of Atlanta on July 22nd, 1864 and an attack by the Confederates on his unit on July 26th. He goes into great detail about the casualties his division and company suffered, including mentioning the death of General James B. McPherson. 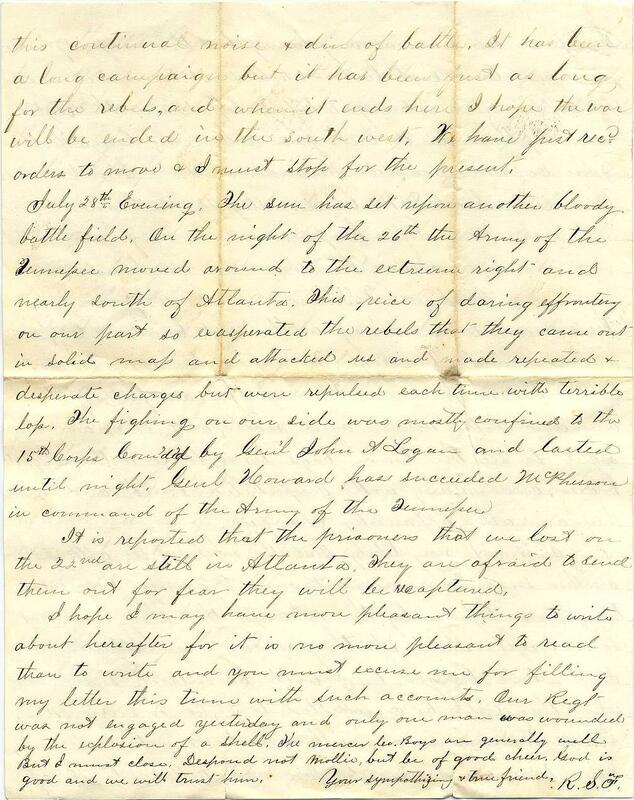 We have been in the midst of exciting times for the last few days and now when the smoke of battle is partially cleared away and usual quiet is restored I will attempt to answer your welcome letter of July 9th which was received on the 18th. I thought and hoped to be able to date letters by this time from Atlanta but this pleasure is still deferred. As it is we are only a mile and a half from the rebellious city but it seems the Rebels have found their last ditch and are determined to die in it rather than yield. The Army of the Tennessee was engaged in another bloody and destructive battle on last Friday the 22nd of which you have no doubt had some account in the papers. During the forenoon of Friday several reports came in that the enemy were moving around in our rear, but it was then supposed to be only cavalry aiming to make a dash upon our train. The 16th Army Corps were laying in the rear and a few Regts from the 17th Corps were sent back and all was supposed to be secure. About noon the Rebels moved up in sight and charged upon the left flank and rear with infty three or four lines deep. The charge was desperate and on the left flank where our Div was placed succeeded in driving our line back a short distance when they changed positions and defeated the rebs driving them back with great slaughter. They made repeated charges during the evening and were each time repulsed. The loss was heavy on both sides but much less on ours because of the protection of earthworks. Eight hundred dead rebels were buried in front of our Division alone and the number of prisoners amounted to three thousand. Major Genl McPherson was killed early in the afternoon during a charge and while riding along the line. In him we mourn a brave and gallant officer a beloved General and a noble man. Genl Logan succeeds him in command of the Army of the Tennessee. Genl Force comdg our Brig and Capt Walker his Adjt Genl were both severely wounded. 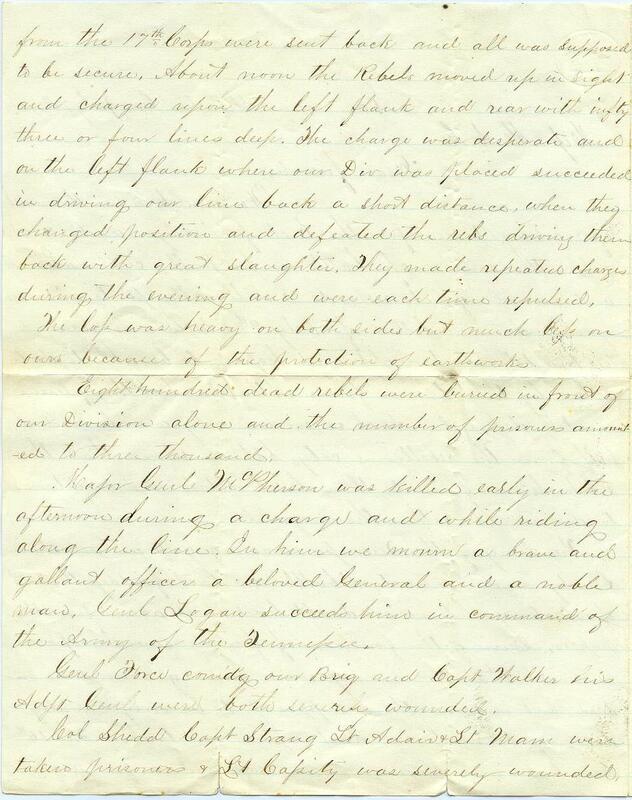 Col Shedd Capt Strong Lt Adair and Lt Mam were taken prisoners and Lt Capity was severely wounded. The loss in our Div was very heavy but the majority were prisoners. Our Regt lost 26 killed 36 wounded and 112 captured making a total loss 172 in the Regt. Of these Co A lost four killed viz George Hill, John Camm, Richard Alexander, and Shull a recruit. The wounded are doing well – Mont Candor and Cooper are now with the Regt. There were three or four of Co A taken prisoners. The hospitals are full of the wounded both union and rebel, and it is a sickening sight to see the brave boys lying there with mangled bodies, and many with amputated limbs, and yet they are all apparently cheerful. It is not very likely that the rebels will attempt another such a movement on our army. They were taught a lesson by the 17th Corps that they will not soon forget. And if they remain in Atlanta a day or two longer they will be entirely surrounded where they will be compelled to fight or surrender. I hope this campaign will soon be over that we may get into a quiet camp for am getting tired of this continual noise and din of battle. It has been a long campaign but it has been just as long for the rebels, and when it ends here I hope the war will be ended in the southwest. We have first recd order to move and I must stop for the present. July 28th evening. The sun has set upon another bloody battle field. On the night of the 26th the Army of the Tennessee moved around to the extreme right and nearly south of Atlanta. This piece of daring effrontery on our part so exasperated the rebels that they came out in solid map and attacked us and and made repeated and desperate charges but were repulsed each time with terrible loss. The fighing on our side was mostly confined to the 15th Corps Com’di’g by Gen’l John A Logan and lasted until night. Genl Howard has succeeded McPherson in command of the Army of the Tennessee. It is reported that the prisoners that we lost on the 22nd are still in Atlanta. They are afraid to send them out for fear they will be recaptured. I hope I may have more pleasant things to write about hereafter for it is no more pleasant to read than to write and you must excuse me for filling my letter this time with such accounts. Our Regt was not engaged yesterday and only one man was wounded by the explosion of a shell. The mercer leo. boys are generally well. But I must close. Despond not Mollie, but be of good cheer. God is good and we will trust him. This entry was posted in Southern Historical Collection and tagged Battle of Atlanta, General McPherson, Georgia, Robert Stuart Finley. Bookmark the permalink.